Graphics by Alev. Programming by Richard. 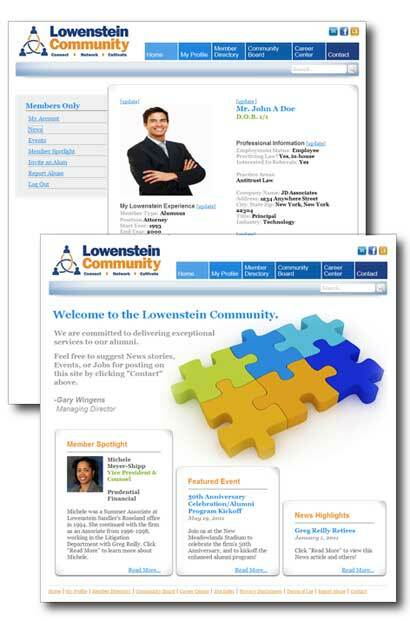 Lowenstein Sandler is a nationally recognized top-ranked business law firm in New York, New Jersey and California. The firm's commitment to its clients is demonstrated through its client-centered, service-oriented culture. Website design and development for a custom, extensive alumni community social portal. Features include: Dynamic content management system - User profile set-up with editable fields and image upload capabilities - Community Forum, News, Event and Job Board interactivity - Searchable alumni directory with expanded search features.